This is the second installment of the notes I am taking while fighting with Lua and C++ to get along. If you have not yet, you may want to read my first post about Running a Lua 5.2 script from C++. Mostly, I have been studying the code from the Lua-User Wiki Sample Code and the Lua 5.2 Reference Manual. Last post was not complicated at all, right? Actually, it does not demonstrate the real power of embedding Lua in your C++ program. I hope that with this example I convince you into further studying and using Lua for your applications. Our goal is twofold. Firstly, we will pass some arguments from the host (C++ program) to a Lua script. Secondly, we will recover in the host some return values from the same script. Yes, return values. Plural because Lua can return more than one argument! Now we have to make a C++ program to pass the information to Lua, execute the script, and recover the information returned from it. As in the previous tutorial, I will give you the whole enchilada and then we will discuss the different pieces in more detail. according to the Lua reference manual. So there is, essentially, nothing new there. where the narr and nrec arguments are our estimation of the number of elements as a sequence and number of non-sequential elements, respectively. Since our table has only two sequential elements, we choose 2 and 0 as our narr and nrec arguments. just sets the index 1 of our unnamed table to the value 49. Notice that it also pops the index and value stored in the stack, leaving the table as the top value of the stack. The last thing we have to do is name the table we have created and populated. This is accomplished by the lua_setglobal() sentence, which pops the top of the stack — our table — and sets it as a global table under the given name — in our case “arg”. 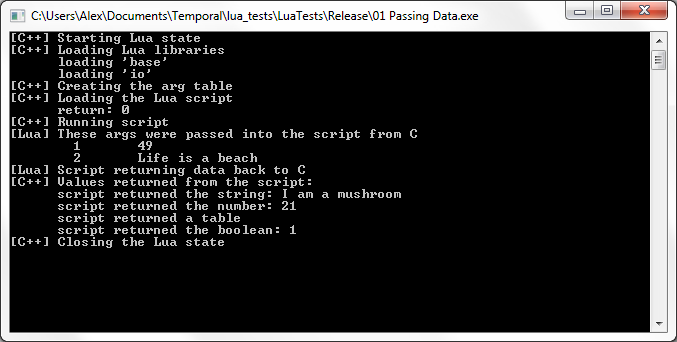 Lua will be able to see this table from the script. Once our script has run, the Lua return values are accessed from C++ via the stack. Notice that Lua pushes first the first return value, and last the last one. Thus, popping from the stack recovers the return values in inverse order compared to the return statement in Lua. This covers the basics of sharing data between the host program and Lua. For instance, you can play with the program changing the Lua script and seeing how the output changes according to that. Remember that you do not need to recompile to see the effects! Stay tuned for the next episode, which will be something related to calling C++ functions from Lua. Read the next tutorial! Very nice, this would help a lot in my game. Thanks. Great tutorial. Though, I am a confused by “lua_settable(lua_state, -3);” The tutorial’s handling of this is a little unclear and I’m still not sure what purpose that function serves, or specifically why “-3” is passed. Any clarity would be appreciated! Then, lua_settable(lua_state, -3) means “set in the table stored in the third element of the stack (‘v’) the element with key equal to the second element of the stack (‘1′) the value stored in the first element of the stack (’49’).